Windfall – lighter than air – is a perfectly named lace pullover worked in a silk wool blend. Imitation Embroidery is its lace, a simple 6 stitch by 6 row repeat. 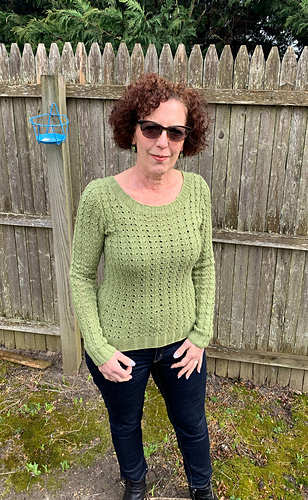 This is a top down design, mostly seamless and trimmed at its hems and neckline with a wide panel rib spawned from the pattern of its lace. Its shallow scooped neckline dips slightly in the back for a romantic touch. Sleeves are worked top down and in the round with short row shaping at their caps, and set in. Enjoy! Shown in Tern yarn by Quince & Co. (75% American wool / 25% silk; 221 yards / 202 m per 50g skein); color – Columbine #403; 5, 5, 6, 6, 7, 8, 8 skeins, or for comparable yarn, approximately 990, 1100, 1230, 1335, 1485, 1595, 1655 yards / 905, 1005, 1125, 1220, 1360, 1460, 1515 m.
I always have additional yarn on-hand for swatching. 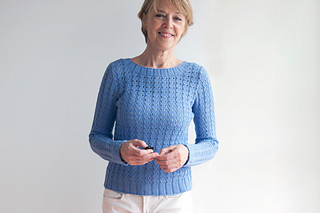 Long-tail cast on, Cable cast on, circular knitting, decreasing (skp, k2tog, p2tog, p2tog tbl), increasing (m1R, m1L, yo), short row shaping, setting in sleeve caps, stitch pick-up around neckline, and blocking. 15 page PDF includes pattern instructions, photographs, schematics, instructional links, and definitions for relevant abbreviations.